The 1970s Diet: Do You Really Know What Dementia Is? I didn't. And I still have a lot to learn but am so glad I was asked to do this post in conjunction with Dementia Friends and Britmums. It gave me the opportunity to learn more about this disease and what it really means to people who are affected by it. We all lose our keys, can't find our phone - hell sometimes we can't find where we parked the car! I'm pretty sure I'm not the only person who has said "I'm losing it" "I'm so forgetful" - my Grandad used to say "if I ever lose my marbles push me off beachy head!" All joking aside, its a bit more complex than forgetting your keys or where you've put things. And its not a disease that just affects the older generation. Early dementia can affect younger people also - like Chris Graham who is only 39 and has been diagnosed. He is the 4th member of his family to be diagnosed. He lost his dad at 42 years of age and his brother is only 43 and is in the latter stages of the disease. His story really moved me when I heard it on BBC Breakfast this week. You can read all about it here on his just giving page. He is trying to raise money, by bike riding across America, so that future generations (possibly his son who has a 50/50 chance of having the gene) may be cured. At the moment there is no cure for dementia. There are drugs that can ease the symptoms but no cure. Having looked at the Alzehmiers's Society Dementia Friends website. I learnt that its not just about having memory loss. Its about being slower in doing the simple things - Gina, 61 describes how she is still coming to terms with being diagnosed with the disease. How it means she's slower in the supermarket queue as she can't work out how much she needs. How she often gets anxious thinking an appointment is immenient when, in fact, it could be a week away. How she gets frustrated and sometime agressive and how sometimes when she looks in the mirror she sees a different person. But we can all help in a small way by becoming a Dementia Friend and I urge you to sign up. Its free and you get sent a booklet about the signs and what you can do to help. For instance, the other day I was in the supermarket and an old man was taking his time. I mean really taking his time. Now 5 years ago I would have been mentally cursing him but even I am more tolerant these days. I thought he's old, it'll come to us all and what comes quick and easy to us can be very difficult for others. The lady behind me was huffing, puffing and was very agitated by the delay. She was actually annoying me more than the old man. He may have had dementia he may not have. But little things like being patient and thinking could this person have the disease can make the person feel less distressed. "I attended a dementia friends information session and I felt inspired to become a dementia friends champion so that I could spread this important message and hopefully inspire others. In my daily job I encounter people with dementia and their families and have seen first hand the difficulties they experience. By making the wider community aware of the issues it will lead to more understanding and patience and help people and their families to live well with dementia. Since becoming a champion I have inspired 29 people to become dementia friends and hope to make many more." It was a great opportunity for not only the adults but for younger people to hear what they could do to help. By all accounts, a third of young people know someone with dementia. This link is for young people and gives them clear advice on what they can do to support someone with dementia. I have also had personal experience of Dementia. My Grandad (not the beachy head one) had the disease in the latter part of his life. He lived in Devon which was miles away from our family. When my family went to visit the house was in disarray and the neighbours said he would often go for walks without his keys, get lost etc. He had always been so very independent - travelling all over the world after my Granny died. He even brought back an envelope from a chap he met and I quote "he seemed a decent enough chap". My Grandad the drugs mule! Unfortunately, others take advantage of the elderly and he had been sending cheques to people who claimed he had won some money. My family found bank stubs showing various amounts having been paid out. The final straw came when he tripped and knocked his head one Christmas Day in 2005. He was taken to hospital and he never returned to Devon. The family decided he had to be closer to them in a care home. Of course, he was most outraged by this as he felt he could live perfectly well on his own. The family had to seek Power of Attorney which isn't an easy thing to do when the person feels like there isn't anything wrong. I know it caused a lot of angst about having to do this but ultimately they were trying to do what was best for their dad. 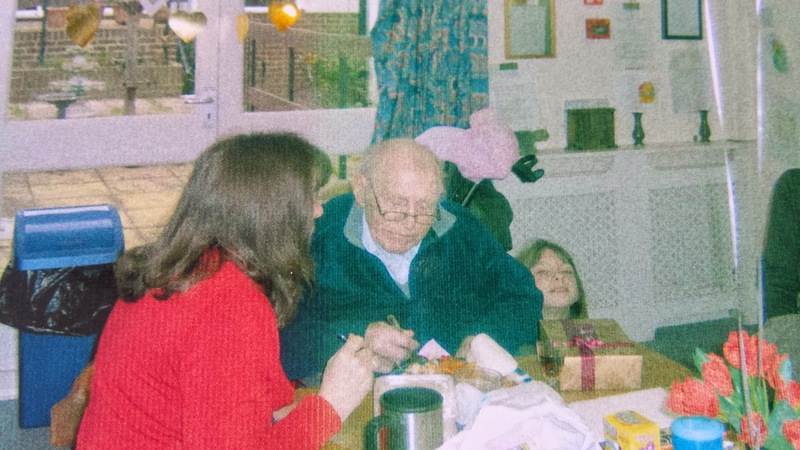 He lived to the grand old age of 92 - spending the last 4 years in the care home. I think its fair to say he had a good innings and he had a good quality of life right up until the end. So never mind about Jeremy Clarkson's petition and getting him re-instated for allegedly punching a man and saying nasty things. Click on something that could make a real difference today. I'm working with BritMums and Public Health England alongside the #BritMumsDementiaFriends campaign. I have been compensated for my time. All editorial and opinions are my own. Visit the Dementia Friends site for more information and resources about coping with dementia among family and friends. Such a thoughtful post and thanks for sharing your personal experiences. Commenting for myself and on behalf of BritMums and thanking you for taking part. Thank you and was a pleasure!